The Back to the Future trilogy is one of the most iconic movie franchises in pop culture. 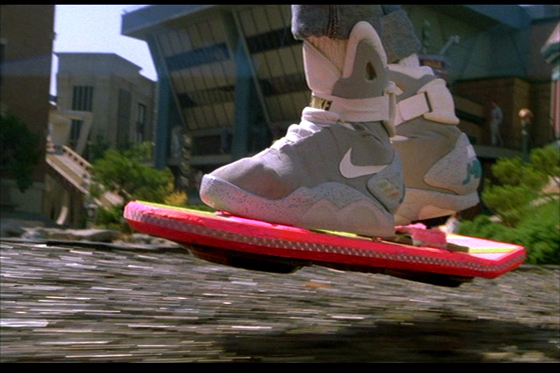 Not to mention Back to the Future 2, with its very successful product placement. The film introduced innovative, futuristic products that were “needed” by many of ’80’s kids, from the flying DeLorean DMC – 12, to the “Mattel” Hover Board, to the automatic lacing Nike “Marty McFly” tennis. While I have yet to see any flying DeLorean’s or was ever able to take a ride on a hover board, Nike may make many of us happy with the development of the Nike Air Mag “Marty McFly”. Although there is no release date or timeline, Nike seems to be moving forward with development of this dream product. It seems Tinker Hatfield and his boys at the Nike Innovative Kitchen have filed patent papers for a shoe with an automatic lacing system, such as seen on the Nike Air Mag from Back to the Future II. Interesting! Peace and Love!